6 - Water Your Trees! 17 - Fitchburg Public Library Wins Gold on its 1st Birthday! Who: For everyone in the neighborhood: families, singles, young, old, new or long-time residents, whatever your color, race, language. Bring yourself, your family, neighbors, and friends. 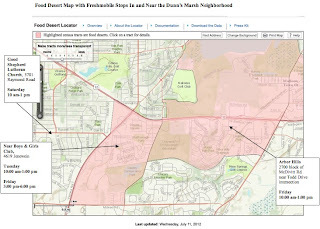 The neighborhood includes the area south of the Beltline & Verona Road, west of Seminole Highway, north of Dunn’s Marsh, and including the Belmar and Allied Drive areas. · acoustic live music, 7-8 p.m. 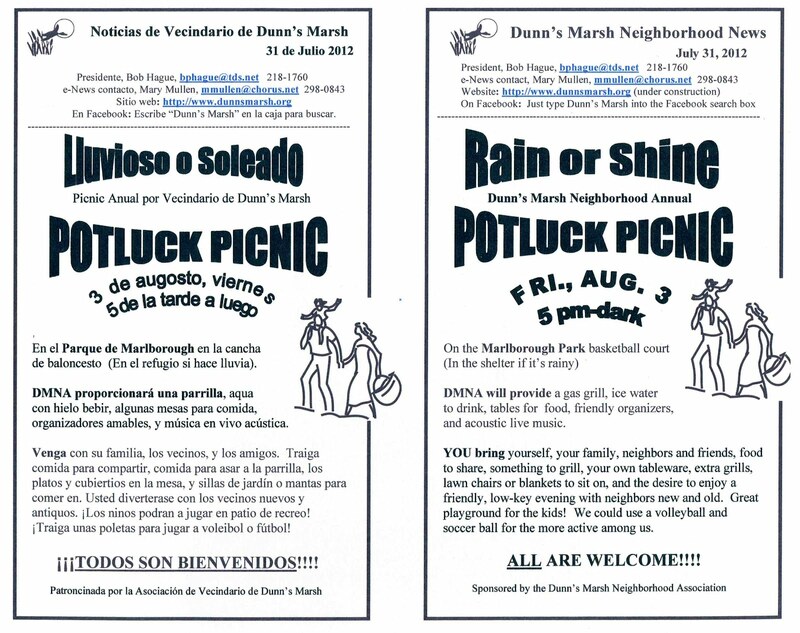 Sponsored by the Dunn’s Marsh Neighborhood Association. 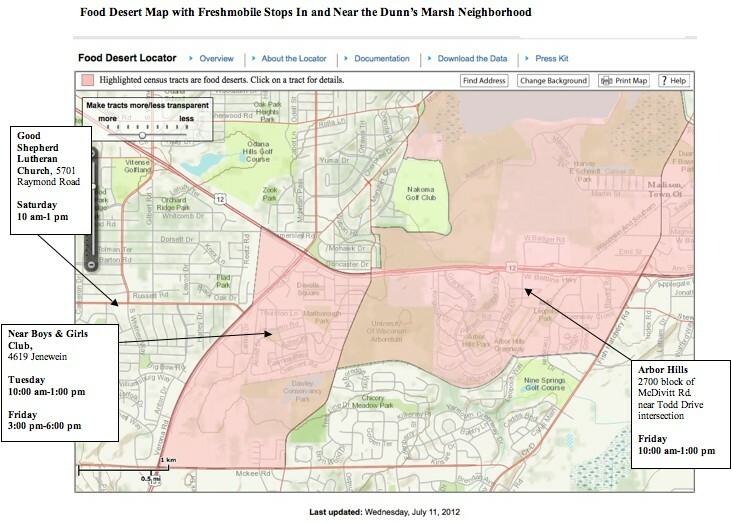 Maybe you didn’t know it, but our neighborhood is what the U.S. Department of Agriculture calls a “food desert.” A food desert is a low income census tract where a substantial number or share of residents has low access to a supermarket or large grocery store. Once upon a time, we had a grocery story just across Verona Road from the neighborhood. It was in walking distance from the neighborhood. Now all you can do where the Cub store used to be is rent a truck. The nearest grocery stores are Aldi’s and Target way down Verona Road and up PD, the Copp’s store down the Beltline and up Whitney Way, and another Copp’s clear over on Fish Hatchery Road. Most of these are 3 miles away. If you don’t have a car, it’s a hassle to get to a full service grocery store. Jeff Mauer, of Madison Fresh Market, decided to do something about food deserts in the Madison area. He developed the idea of the Freshmobile, a mobile grocery store that could bring fresh fruits and vegetables, milk and dairy products, and other healthy food to food deserts. A major interest was to do this at affordable prices for people who buy groceries. · Tuesday, 10:00 a.m.-1:00 p.m.
· Friday, 3:00 p.m.-6:00 p.m.
· Friday, 10:00 a.m.-1:00 p.m.
· Saturday, 10:00 a.m.-1:00 p.m. The DMNA Council will meet on Wednesday, August 8, 7 p.m. at Prairie UU Society, corner of Crawford and Whenona. As is often true, the Council will be having a special guest. This month’s guest will be giving us a half hour presentation about the Energy Service Corps. The Energy Service Corps offers free home energy assessments and energy efficiency tips to help homeowners and renters save money on their energy bills. Any resident may attend the Council meeting to learn about issues and initiatives in the neighborhood. Often, when there’s a presentation, residents are invited to ask questions of the presenter or express opinions, but normally only Council members participate in discussions that will lead to Council decisions. Only Council members may vote. The Dunn’s Marsh Neighborhood Association holds its annual meeting in October, and that is the time that residents are urged to bring up their concerns and ideas and elect a new Council to serve for the year. MADISON – Earlier this month state and county health officials announced that a bird recently tested positive for West Nile virus in Dane County, the first to do so in Wisconsin this year. Although very few mosquitoes actually carry West Nile virus, infected birds serve as an early warning by indicating the virus is present in the area and people should be more vigilant in protecting themselves against mosquito bites. West Nile virus is spread to people and horses through the bite of an infected mosquito. People must be bitten by an infected mosquito in order to contract the virus. Mosquitoes become infected with West Nile virus by feeding on infected birds and then potentially transmit the virus by biting other animals or people. · Apply insect repellant to clothing as well as exposed skin because mosquitoes may bite through clothing. · Properly dispose of items that hold water, such as tin cans, plastic containers, ceramic pots or discarded tires to prevent mosquito breeding. Turn over wheelbarrows, wading pools, boats and canoes when not in use. · Trim tall grass, weeds and vines because mosquitoes use these areas to rest during hot daylight hours. The chances of a person becoming infected with the West Nile virus are very low and most infected people will not have any symptoms. Those who do become ill typically develop a fever, headache, and rash that lasts a few days. Symptoms may begin between three to 15 days after being bitten by an infected mosquito. Older adults and people with compromised immune systems are at an increased risk of severe disease from the virus and can develop neurologic illness such as meningitis, seizures, and paralysis. There is no specific treatment for West Nile virus other than to treat symptoms. If you think you have a West Nile virus infection, contact your healthcare provider. Statewide surveillance activities for West Nile virus began May 1st. People who find a dead bird in their yard or who have a question about a dead bird should call the Dead Bird Reporting Hotline at 1-800-433-1610. Horse owners should contact their veterinarian to get their horse vaccinated or if they suspect their horse is ill. The Department of Health Services has monitored the spread of West Nile virus since 2001 among wild birds, horses, mosquitoes and people. In 2002, the state documented its first human infections, with 52 human cases. In 2011, three human cases of West Nile virus were reported throughout the state but there were no cases in Dane County. As many who've become familiar with Dunn's Marsh over the past years and decades have noticed, the marsh has seen dramatic highs and lows especially in the past 4 years. 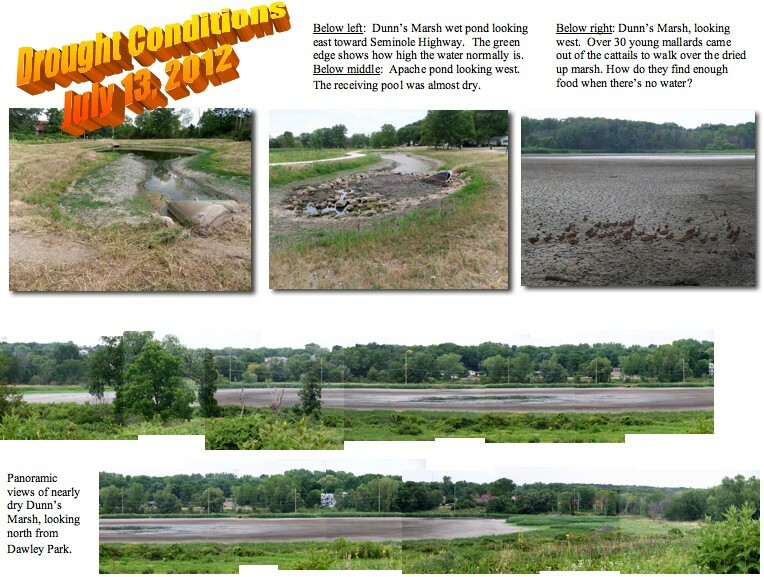 Lowest water elevation = about 938.5 (nearly completely dry) on July 17, 2012 following ~1 month of drought conditions. The marsh was reduced to 2 large puddles (about 200' x 150' each) by July 12, 2012, one in the center of the marsh and one in the NE corner. 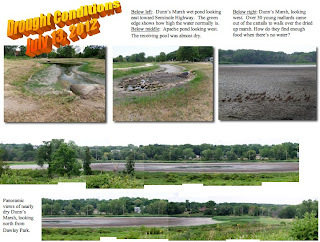 By July 17th, the center puddle had entirely dried up leaving only a ~150' x 100' puddle in the NE corner of the marsh. Several local residents who've lived in the area all their lives said this is the lowest they've ever seen the marsh. One resident is about85 years old. The rains from July 17 and 18 filled Dunn's Marsh back up to its normal elevation and water again began flowing out through the Seminole Highway culvert. The Fitchburg Parks, Recreation & Forestry Department is asking for your help to preserve the health of our trees (including trees along the street) by watering them during hot, windy, and dry weather conditions, especially small trees planted within the past 2 to 3 years and those with damaged or confined root systems. Of course, Madison trees are suffering just as much as Fitchburg trees. So water your trees! Although Madison is not experiencing a water shortage, the Water Utility advises residents to be smart about how they use water in their homes and yards during the current heat wave and dry conditions. Water demand typically rises in the summer months, according to Water Supply Manager Joe DeMorett, so the utility is always alert to increased pumping requirements during periods of excessively high temperatures and dry conditions. "We will continue to closely monitor water demands and coordinate with neighboring water utilities as needed," he said. "People need to keep themselves well hydrated by drinking plenty of healthy tap water, but they can conserve water in other ways," DeMorett said. • Water your garden and flower beds early in the morning or later in the evening to prevent excess evaporation. • Water the lawn only when needed. Step on the grass; if it springs back up when you move your foot, it does not need water. Established, healthy lawns can survive several weeks of dormancy during summer with little or no water. • If you must use a sprinkler, adjust it so you're not wasting water by sprinkling the house, sidewalk, or street. • Use a broom rather than a hose to clean driveways, sidewalks and patios. • Wash cars and boats with a bucket and a sponge, using the hose only for the rinse. • In the house, repair leaks in faucets, shower heads, and toilets to avoid wasting water. • Install water-saving devices: aerators for kitchen and bath taps, flow regulators for shower heads and toilet tanks, and high-efficiency toilets to reduce the amount of water used in every flush. The Water Utility offers a rebate for high-efficiency toilets. • Turn off the tap when you're not actively rinsing (toothbrush or razor as well as in the kitchen) or washing hands. • Use the most efficient settings for dishwashers and clothes washing machines. Full loads are often the most efficient. Consider shorter showers to conserve water. This past week, Fitchburg staff was able to install 14 signs designed to educate area residents on stormwater throughout the Nine Springs Creek Watershed. Three of these signs are located at Apache Pond. Other Apache Pond news: Ongoing vegetation management, performed by Stantec, will continue through 2013 to encourage native vegetation and cull out invasive/non-native vegetation. Memorial benches are currently being planned in the area recognizing Dr. James Zimmerman and Dr. James Bloodworth. If you have any feedback on Apache Pond and/or the Nine Springs Creek Stormwater public information signs, please contact rick.eilertson@city.fitchburg.wi.us. Fitchburg received a $75k grant from DNR to construct a stormwater pond near the intersection of Red Arrow Trail and Crescent Road. The clearing and forestry mowing was conducted in March 2012, wetland delineation, topographic surveying, and soil pit profile were completed between April and June 2012. Design and bidding will be finished by Fall 2012 with construction anticipated between Winter 2012/13 and Summer 2013. 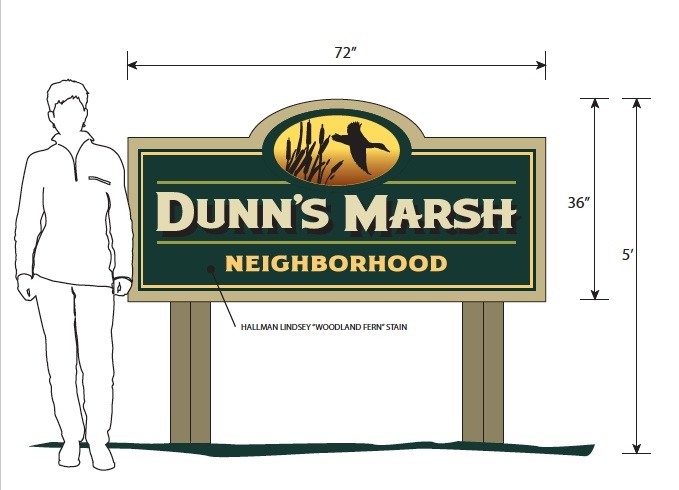 If all goes well, the Dunn’s Marsh Neighborhood sign will be a reality before the end of the summer. In the next few days utilities will be marking the right of way on the frontage road in front of Midwest Financial . This will allow for deciding the exact location of the sign, and soon all will be set for putting the sign in. At the July Council meeting, the Council approved the final design as submitted by Susan Cary of Cary Signs LLC. The approved design is attached. Since then, neighborhood resident Susan Kilmer has been working on the planting plan for the sign. Susan’s plan features perennial native plants with a space for a few annuals in the front. Twenty-one different kinds of grasses and forbs are on her planting plan. Once all the required maps are turned in for a permit, and the permit is granted, the only thing left is for Cary Signs to complete the actual sign and set it. 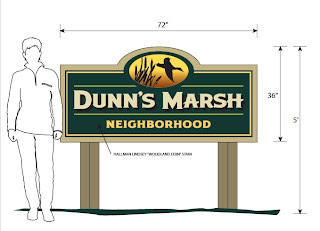 The Dunn’s Marsh Neighborhood sign will be located 8 feet back from the curb of the Beltline Frontage Road in front of Midwest Financial and west of fire hydrant. To make it more visible to those coming across the Seminole Highway bridge, it will be slanted somewhat toward bridge. Back on May 15, the City of Madison Common Council approved locating the sign in that area. Neighbor Kent Seeker has volunteered to help install the plantings and then care for them later. Other volunteers would be welcomed to help with planting and maintenance. Contact one of the people listed on the masthead of the e-News to volunteer. Due to the trying conditions of summer, plantings probably won’t be added until fall. 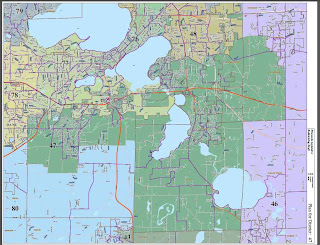 Dane County recently revised its Five Year Plan for Open Space and Parks. Dane County has seen a major increase in park visits in those parks that permitted mountain biking and has worked closely with the Capital Off Road Pathfinders (CORP) to build and maintain trails in Cam Rock County Park. One of the major issues that have limited mountain biking is distance from downtown Madison. Cam Rock is 25 miles away. Dane County asked CORP to identify any other parks that would be suitable for single track mountain biking. One of the areas that were submitted was County property adjacent to the City of Fitchburg’s Dawley Park on S. Seminole Highway. The area once had a cross country ski trail, but it is now abandoned. The sloping terrain would be suitable for mountain biking. The area is overgrown with buckthorn, box elder and wild parsnip and is effectively useless now. The major appeal of the proposed mountain bike area is its location and accessibility to existing/planned bike trails. The area is 8 miles from the State Capitol. It is bordered by the Capital City Trail and Badger State Trail. Those trails intersect at the Badger Trestle with the Southwest Commuter Trail and the new Cannonball Trail. Another CORP-maintained mountain bike trail at Quarry Ridge (definitely not a beginner trail!) is just 2.5 miles away along the Military Ridge Trail. The City of Fitchburg has proposed to expand parking at Dawley Park and build a shelter to promote bicycling, making this an ideal trail head. CORP volunteers have visited the site and developed a preliminary plan for a beginner/intermediate trail. 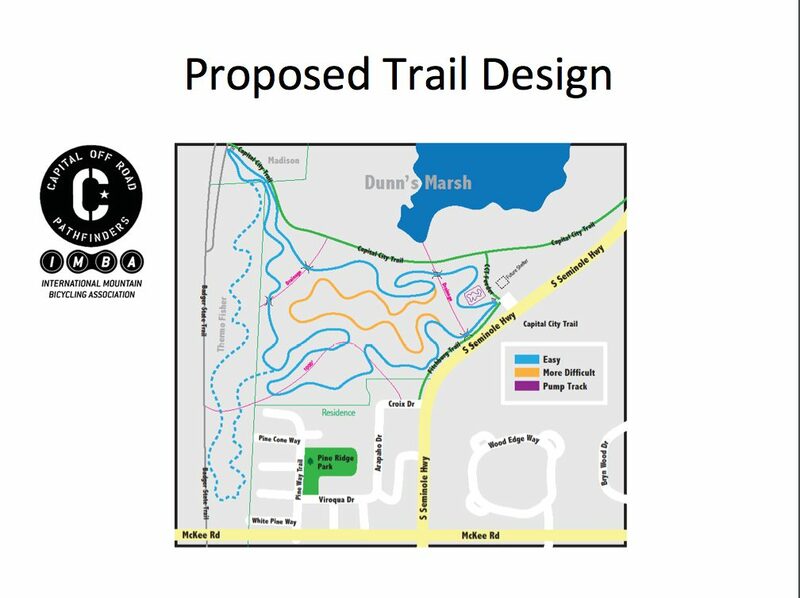 Once the invasive species have been removed, the International Mountain Biking Association will send its trail building team to develop the final design based on its sustainability and erosion control criteria. IMBA has donated $5,000 for this service. CORP’s 500+ members have volunteered to remove the invasive species in cooperation with the Friends of Capital Springs Recreation Area. CORP has indicated that it would also solicit funding from the Madison biking community to invest in any infrastructure needs. The Madison biking community is very supportive of this new “kid-friendly” park area. This park is less than two miles from the world headquarters of Saris Cycling Group and Pacific Cycle (Schwinn). Dream Bikes, a 501(c)3 charitable organization devoted to teaching bike maintenance skills to inner city youth, is one mile from the park and is very excited about teaching clinics. The Friends of the UW Arboretum have also agreed to support this park as a way to reduce pressure on its environmentally sensitive trails. 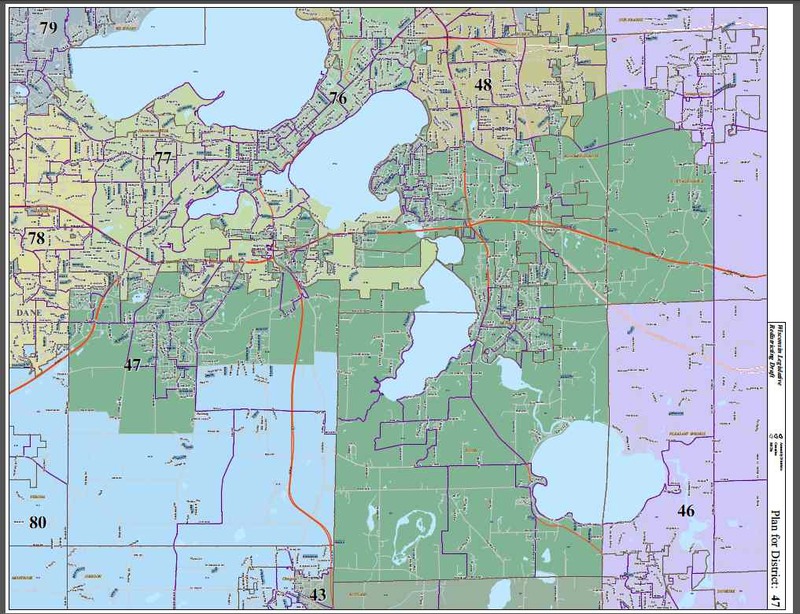 Concerned about some Verona Road design details they learned at the public presentation on May 17, Dunn’s Marsh Neighborhood Association representatives met with the Wisconsin Department of Transportation (WisDOT) and Strand Associates on July 23. Below is the list of discussion items and some of the things we’ve learned about the design stage of the reconstruction of the Verona Road/Beltline intersection. Construction on intersections outside of the main intersection will be done in 2013. This will include work on the intersections on Seminole Highway at Sentinel Pass and at Co. Hy. PD. Major construction on Verona Road will probably begin in 2014 and continue for 2 or 3 years. 1. Concerns about the Seminole Highway Bridge. The space between the Beltline pavement and the bottom of the bridge must be increased from the substandard 15’3” to today’s standard of 16’3” to 16’9”. We learned that the bridge will be out for 75 days while it is rebuilt with girders that are 36 inches rather than 45 inches tall. We wondered why all the increased clearance couldn’t have come from lowering the Beltline since we were told the Beltline would be lowered just 6 inches. The authorities told us that the Seminole bridge dates from 1958, has wood pilings, and it is about to reach the end of its projected life. The new bridge will match today’s width, but the sidewalks will be widened by a half foot to 6 feet. This reconstruction will happen after work on Verona Road, the eastbound lanes of the Beltline, and probably after the work on the westbound Beltline lanes or at the same time the westbound lane work. This is several years away. 2. Concerns about increased traffic on Seminole Highway adjacent to the neighborhood. We were concerned about whether Seminole Highway would be signed as an alternative route during Verona Road reconstruction. That would direct more traffic to Seminole. The authorities reassured us that the only signed alternative route would be Highway M starting in Verona. Highway M runs parallel to the Beltine but further south. A new roundabout will be built in Oregon to make it easy for motorists to get onto M at that end of the road. However, it is projected that during Verona Road construction, 350-450 more vehicles would be using Seminole during peak hours. That will create a BIG problem for Dunn’s Marsh neighbors who have get out of the neighborhood using Seminole. One idea to slow traffic is to give visual cues to motorists that Seminole isn’t just a speedway for cars but is a local street where bikes should be safe. It may be possible to widen the white stripes that separate the bike lanes from the motorist lanes, but this was not promised. Since then, at least one of us has seen that solution on another local street. Epoxy reflective paint will be used. The idea of increasing the width bike lanes - and thus narrowing the motor traffic lanes and slowing traffic - was turned down. Another concern was for bicyclists who will be crossing Seminole on the two bike trails that span Seminole - the Capital City Trail and the Cannonball. We were told of a possibility of having a median refuge island at the Seminole bike crossings, but again this is not a promise. However, striping like that now at the Capital City Bikeway crossing will also be used at the Cannonball crossing which is closer to our neighborhood. The authorities said they were not considering caution lights at these crossings, something the DMNA would like to see. We also learned that Fitchburg is creating a new truck restriction in its ordinances. We already knew that a traffic light will be added on Seminole at Sentinel Pass. This will allow motorists to exit from Sentinel and will make for a gap in traffic that will allow cars from Clover, Daisy, Lilac, Milford, and Sheffield and the Seminole driveways between those streets to get into the flow of traffic. Regardless, for neighborhood drivers who have to use Seminole, there will be several years of congestion and frustration. We learned that there will be 42-inch tall concrete barriers along the Beltline. They should considerably cut down on the tire soound that makes up a lot of the racket of traffic noise. If we understood correctly, there will be similar barriers on the Beltline overpass of Verona Road. This was a concern because the Beltline will be considerably raised above its current height there. Another feature to lessen traffic noise is the orientation of the grooves in the pavement. Now they are crosswise, and tires beat against them. The new Beltline pavement, starting at Pacific Cycles, will have grooves running parallel to the direction of the road. This will quiet tire noise. We had already learned that all the proposed sound walls will be built because the majority of “receptors” voted for them. This means there will be a very tall wall along the Beltline where the Highlander Motel was. It will extend east to Niemann Place. This is the only noise wall that will protect the Dunn’s Marsh Neighborhood. What about the noise-deadening berms (small hills of earth) that had been mentioned as a protective feature along the Beltline frontage road in the block extending east to Whenona? Apparently, there won’t be much in the way of berms because of the relocation of the pedestrian overpass. Today’s overpass is aligned with Whenona Drive. The new one will cross further to the west. Bikers and pedestrians will be able to access the new overpass from both Niemann Place and Whenona Drive. Some retaining walls - not noise walls - will be associated with construction of the overpass. 4. Pedestrian/Bike underpass safety concerns. The DMNA had heard nothing but concerns about WisDOT’s plan to construct a ped/bike underpass under Verona Road at the Beltline. Both the DMNA and ADMNA had requested an overpass. During the discussion on July 23, the authorities emphasized that the standard underpass is 14 feet wide while this one is slated to be 20 feet wide. It will be 8 feet tall. By comparison, the pedestrian underpass near the Kohl Center is 12 feet wide and 9 feet tall. They pointed out that there will be a 8x20-foot skylight in the middle of the underpass. This underpass will be 300 feet long. They noted that there can be on-going discussion about safety issues in the tunnel. DMNA reps suggested bright lighting and mirrors since one won’t be able to see through the tunnel due to the fact that it dips well below the entrance level. 5. Community Input into art and aesthetics of the construction. Neighborhood attendees at the May 17 public information meeting were surprised to hear that WisDOT had already selected a “Driftless Theme” for the concrete work associated with the Verona Road reconstruction and that there was no allusion to the art and murals that authorities had previously emphasized would be planned with neighborhood input. The issues brought up by DMNA reps at the July meeting were 2-fold: community input and the art/aesthetics itself. We learned in July that “Driftless Theme” means that concrete “form liners” would give a limestone-like texture to the concrete walls of underpasses and overpasses. A stain would give the yellowish color of limestone to the texturized walls. Stain could be various shades to more accurately mimic real limestone, but only a single color is in the works. By contrast, the rebuilt Seminole bridge will display the “Capital Theme” that is already seen in some overpasses on freeways east of Madison. At this July 23 meeting with DMNA neighborhood reps, authorities claimed that murals and art were not stated in the Final Environmental Impact Statement (FEIS). They seemed to imply that murals and art had perhaps never been mentioned even orally and certainly didn’t need to be implemented since they were not named in that official document. A later check - after the meeting - found no specific mention of murals in the FEIS, but there was a statement that WisDOT would “involve residents to a considerable degree developing context sensitive features, aesthetic treatments and landscaping during the design phase of the project.” (p. ES18) To the authorities at the July meeting, the phrase “context sensitive features” apparently means the concrete and the landscaping that provide the aesthetics or appearance of the project, and not murals or public art. We learned that there is a $1,000,000 budget for context sensitive features. The planners did not respond favorably to considering examples of art treatments on freeways in Ohio and New Mexico. As far as we could tell, the only input sought from Dunn’s Marsh residents was from those who had been allowed to vote on sound walls - just a select few from one apartment building on Niemann Place and the subsidized housing on Britta Parkway. As far as we known, the wider community hasn’t been consulted on aesthetics or “context sensitive features” at all during this design phase. This issue will probably be pursued by the DMNA. Attending the meeting were Donna Sarafin and Mary Mullen from the DMNA; Mark Vesperman and Katrina Feltes from WisDOT; Joe Bunker and Eric Hanson from Strand Associates; Chris Petykowski from City of Madison; Paul Woodard from City of Fitchburg; and Ken Saiki and Nik Swartz from Ken Saiki Design. If you live on the odd numbered side of the street, sprinkle your lawn on odd numbered days. If you live on the even numbered side of the street, sprinkle your lawn on even numbered days. If it is necessary for you to sprinkle you lawn please do so before 9:00 am or after 9:00 pm as indicated above. Newer trees may be watered as needed. Please note, placement of new yards is not advised. We do advise you water newer trees (including street trees between the curb and sidewalk) and plants that are susceptible to damage from this dry period. questions pertaining to the Press Release should be directed to Paul Q. Woodard, Director of Public Works, at 270-4260. The Fitchburg part of the Dunn’s Marsh Neighborhood includes all or part of these streets: Sentinel Pass, Crescent Road, Pawnee Pass, Aztec Trail, Jenewein Road, Belmar Circle, Thurston Lane, Rosenberry Road, Equity Lane, Unity, Renaissance Drive, New Freedom, Apache Drive, and Cochise Trail. United Fitchburg announces an Assembly Candidate Forum on August 6 for the upcoming 47th and 80th Assembly races. Both Assembly districts represent parts of Fitchburg and both have a Democratic primary on August 14th. (The Republican primaries for these districts are uncontested.) Donna Rosinski, co-chair of United Fitchburg states, “We have set up this forum because it is important for the Fitchburg community to have the opportunity to learn more about the candidates before voting”. The Fitchburg part of the Dunn’s Marsh Neighborhood is part of District 47. District 80 includes most of the southern part of Fitchburg. Candidates for the 47th district, Amanda Hall and Robb Kahl have been invited to participate. Candidates for the 80th district, Representative Sondy Pope-Roberts, Charlie Uphoff and Joe Wineke have been invited to participate. The forum will be moderated by a member of the Dane County League of Women Voters. The forum will take place on Monday, August 6 at the Fitchburg City Council Chambers in Fitchburg City Hall, 5520 Lacy Road, Fitchburg. The forum will run from 7-8:30pm and will also be televised live and subsequently rebroadcast by Fitchburg Community Access Television (FACTv). followed by a screening of "The Story of Stuff" at the library starting at 7pm. and calls us together to create a more sustainable and just world. It'll teach you something, it'll make you laugh, and it just may change the way you look at all the stuff in your life forever." Please contact walker.evans@city.fitchburg.wi.us or 729-1784 with any questions or comments on this or other Fitchburg Green Thursday events. Library Director Wendy Rawson announced that the Fitchburg Library won the Leadership in Energy and Environmental Design (LEED) Gold certification on June 29, 2012 (The Library's 1st Birthday). You’ve no doubt seen it covered on the TV news, but here’s your last chance this summer to actually experience Madison Eat and Greet. Read more to learn what it is. Then go to the Meadowood Shopping Center this Thursday, August 2, to enjoy a variety of foods from food carts and mingle with neighbors from a neighboring neighborhood. Madison Meet and Eat is unique event that brings a collective of Madison’s food cart vendors right to a neighborhood and encourages the community to connect and enjoy a fun night out. Attendees have the opportunity to purchase and enjoy delicious and diverse menu items while enjoying the company of friends and neighbors. Madison Meet and Eat is a City of Madison planned event. The final Madison Meet & Eat of the summer will be held on Thursday, August 2 from 5:00-7:30pm. The summer 2012 Meet & Eat events will be held in the lot adjacent to and near Meadowood Shopping Center at 5800 Raymond Road <http://maps.google.com/maps?q=5800+Raymond+Road,+Madison,+WI&amp;hl=en&amp;sll=37.0625,-95.677068&amp;sspn=52.020054,78.662109&amp;oq=5800+Raymond+Road.&amp;hnear=5800+Raymond+Rd,+Madison,+Wisconsin+53711&amp;t=m&amp;z=16> . Bathrooms: There will be portable toilets on site. Guests are encouraged to walk, bike or bus to the event as there is limited parking on site. Please park on neighborhood streets or limited parking will be available at the Meadowood Shopping Center. Join us for a neighborhood trip the Goodman VERONA swimming pool every Wednesday night from the Meadowood Neighborhood Center. Free admission and free transportation!! Destinations will change from week to week. Bus loads at 5:45pm and returns shortly after 8pm. YOU MUST PRE-REGISTER by calling 467-8360. You must have a purple registration form on file to attend. You can stop by and fill one out and register at the same time. Great opportunity to cool off on these hot days! The Meadowood Community Center is in the Meadowood Shopping Center at 5734 Raymond Road about a mile from the Dunn’s Marsh Neighborhood. The Meadowood Neighborhood Center will be serving FREE LUNCH for Youth ages 2-17, M-F from 12-12:30. Youth under the age of 6 must be accompanied by an adult. The free lunch program runs through August 17. Tell your neighbors! Just wanted to let you know that we have added a Middle/High School basketball program to our summer line up. We are offering a drop-in basketball program at the Toki Gym on Tuesday nights from 6-8pm. There is no charge to participate. Please enter the doors off of the parking lot. Coach Tharpe and Mr. Michael are leading it. The program will run until the end of August. If you are interested in participating or know of someone who would be interested, please forward this to them. The Boys and Girls Club in our neighborhood offers many programs. To find out about them and how to participate, stop by the Club at 4619 Jenewein Road. Kids must be members to participate, but membership is pretty easy to achieve. Each month, the Arboretum offers a free night walk, thanks to support from the Friends of the Arboretum. Join the naturalist on Saturday, August 4 from 8 to 9:30 p.m. and enjoy the sounds and sights of Arboretum nightlife as the naturalist points out items of interest that may not be apparent to the casual observer. The City of Madison and Madison Parks are pleased to host Ride the Drive - Northside, presented by Trek, on Sunday, August 12, from 10am-3pm. Ride the Drive is a community event that transforms some of Madison's streets into a public promenade. During the event, roads in the five mile route are open for participants to bike, skate or walk through some of Madison's signature streets - including Sherman Avenue, Warner Park, and Troy Drive. The event is free and open to the public. Along the route, there will be activities, informational booths, musicians, food vendors and a drawing for prizes. Ride the Drive is more than just going out for a bike ride! Along the route, there will be five activity villages and stopping points. The five activity villages will be located at Warner Park at the Mallards Stadium, Troy Gardens, Warner Beach, Sherman Ave, and St. Paul’s Church. Each stopping point will have an information tent, water, bathrooms, but also an abundance of activities, music, food, and vendors. For a full list of events, vendors, locations, and volunteer opportunities please visit the Ride the Drive website. This event will be similar to the six events that have been held downtown, but will also showcase the uniqueness of the northside. The success of the event is thanks to our sponsors and supporters: Trek, Triple M 105.5, Charlie FM, WOLX 94.9, Northside Planning Council and UWSP Adventure Tours. A Ride the Drive informational meeting will be held on Tuesday, July 31 at 6:30 pm at the Warner Park Community Recreation Center, 1625 Northport Drive. The meeting will include information about the event, details for residents, safety, and alternative traffic routes. We hope everyone comes out on August 12 to Ride the Drive! A 16" Raleigh Mojave 8.0 mountain bike was taken from the Dunn's Marsh side of the Cannonball Path, ~halfway between Badger Trail and Seminole Highway on Wed., July 18, 2012 between 9:25am and 9:35am. The bike is black. The owner is offering up to a $250 reward if the bike is returned to the owner in good condition. Contact Rick at 235-0412 for further details. Looking for an opportunity to give back to your community? Elder Friends are needed to provide friendly home visits to seniors Madison. The Elder Friends Program through Peer Support of Dane County connects older adults (60+) with a trained Elder Friend. The program gives homebound or isolated seniors a chance to connect with a warm listener, and provides volunteers with a meaningful way to give back to their communities. In most cases, long lasting and mutually rewarding friendships develop. No experience needed, training provided. This is a flexible volunteer opportunity. To learn more about the Elder Friends program or request an application packet, please contact Anita Brown-Huber @ 608-846-9469 or abrown-huber@thecommunitycornerstone.org. Here is a quick and easy volunteer project for anyone wanting to help with meal distribution near the Dunn’s Marsh Neighborhood. 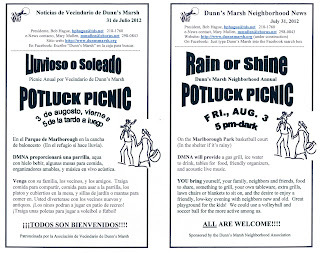 We need volunteers to help pack brown bag meals for the Meadowood Park Program. This entails making 30-40 sack lunches at a nearby church, which will be given to the kids before they leave the Meadowwood Park program. If you are interested, please contact Sherri at ksnhh@juno.com <mailto:ksnhh@juno.com <mailto:ksnhh@juno.com> > or 273-1743. She can provide additional information and days/times where help is needed. You can choose how many days you wish to help. We do have some help, but are definitely short on certain weeks. The Helping Hands Food Pantry located in the High Point Shopping Center at 7475 Mineral Point Road, Suite 35, needs many kinds of donation items. Drop your donations off at the pantry location on the corner of D’Nofrio and Mineral Point Road next to Pedro’s Restaurant, 608-446-2718. Designated by a Joint Resolution of Congress in 1971, Women's Equality Day commemorates passage of the 19th Amendment to the U. S. Constitution in 1920, guaranteeing women the right to vote. This recognition of women's Constitutional rights was the culmination of a massive, peaceful, national movement by women that had its formal beginnings in Seneca Falls, New York in 1848. NOW, THEREFORE, BE IT RESOLVED, the Senate and House of Representatives of the United States of America in Congress assembled, that August 26th of each year is designated as Women's Equality Day, and the President is authorized and requested to issue a proclamation annually in commemoration of that day in 1920, on which the women of America were first given the right to vote, and that day in 1970, on which a nationwide demonstration for women's rights took place. The National Women's History Project lists a wide-array of materials to celebrate this historic event on our webstore Women's Rights and Women's Equality Day Resources <http://shop.nwhp.org/womens-rights-and-womens-equality-day-resources-c198.aspx <http://shop.nwhp.org/womens-rights-and-womens-equality-day-resources-c198.aspx> > This includes a new Women's Equality Celebration Kit <http://shop.nwhp.org/womens-equality-celebration-kit-p5356.aspx <http://shop.nwhp.org/womens-equality-celebration-kit-p5356.aspx> >. Everything a person would need for an educational, entertaining and successful Women's Equality Day program in one convenient kit. This kit makes it easy to present an informative one-hour program at your workplace, community group, or civic organization. Voting is the foundation of our democracy. Let’s honor and celebrate the 92nd Anniversary of women in the United States winning the right to vote.